Train hard and go home safe with our Krav Maga classes at USA Professional Karate Studio. 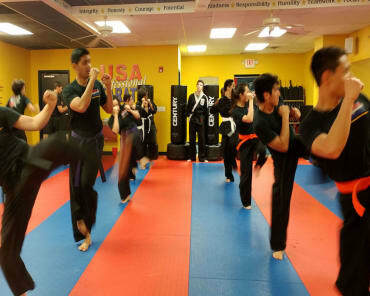 Taught by Chief Instructor and Sensei George Mowod, a 6th Degree Black Belt in Karate and licensed Krav Maga Worldwide Instructor, our classes offer the most comprehensive self-defense and fitness training in Squirrel Hill. The literal translation from Hebrew to English is "contact combat" or "close combat". Krav Maga is the most effective, real world, self-defense system. It was originally developed for the Israeli military and is now the preferred system for U.S. military units and law enforcement agencies. Based on simple principles and instinctive movements, this reality-based system is designed to teach extremely effective self-defense in the shortest possible time. With Krav Maga you learn how to defend against common chokes, grabs, and strikes as well as even more serious threats involving weapons. Our instructors teach people how to function during the stress and shock of a sudden, violent encounter. Although Krav Maga training is intense and aggressive, there is no experience necessary to begin. Every class is a fun and vigorous workout that will challenge you, build confidence and keep you physically fit. Join us and get strong, confident and safe! Krav Maga Worldwide was created in 1999 to help spread Krav Maga training across the United States and around the globe. The company certifies instructors and oversees quality control at hundreds of authorized Krav Maga Worldwide training centers in the United States, Canada, Japan, Mexico, and Europe. 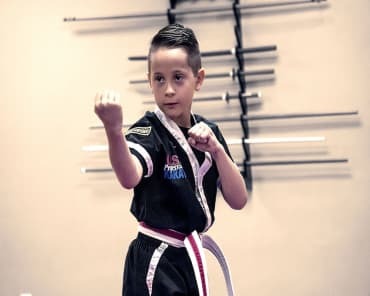 At USA Professional Karate Studio, we bring that internationally renowned training to Squirrel Hill and Pittsburgh with Sensei Mowod for the best training anywhere in town. Start Your Self Defense Training With Real Krav Maga Today! Krav Maga in Squirrel Hill proudly and officially provides Fitness, Self-Defense, and Fighting skills that you can put to use in any situation. Fill out the short form on your screen now for more information on these or any other classes offered at USA Professional Karate Studio.